Heat oven to 325°F. In 1-quart saucepan, heat butter, 1/4 cup whipping cream and the brown sugar over low heat, stirring occasionally, just until butter is melted. Pour into two 9-inch round cake pans (do not use dark or nonstick pans). In large bowl, beat cake mix, water, oil and eggs with electric mixer on low speed 30 seconds, then on medium speed 2 minutes, scraping bowl occasionally. Carefully spoon half of cake batter into each pan, starting at outer edge and continuing toward centre so brown sugar mixture does not get moved out to sides of pans. Bake 30 to 37 minutes or until toothpick inserted in centre comes out clean. Run knife around edge of cakes to loosen from pan. Turn upside down onto cooling racks, placing waxed paper under racks to catch drips. Leave pans over cakes 1 minute before removing. Cool completely, about 1 hour. In chilled medium bowl, beat whipping cream, icing sugar and vanilla on high speed until stiff peaks form. On serving tray, place 1 cake layer, brown sugar side up. Spread with half of the whipped cream. Top with second layer, brown sugar side up. Spread with remaining whipped cream. Sprinkle with toffee bits. Store covered in refrigerator. 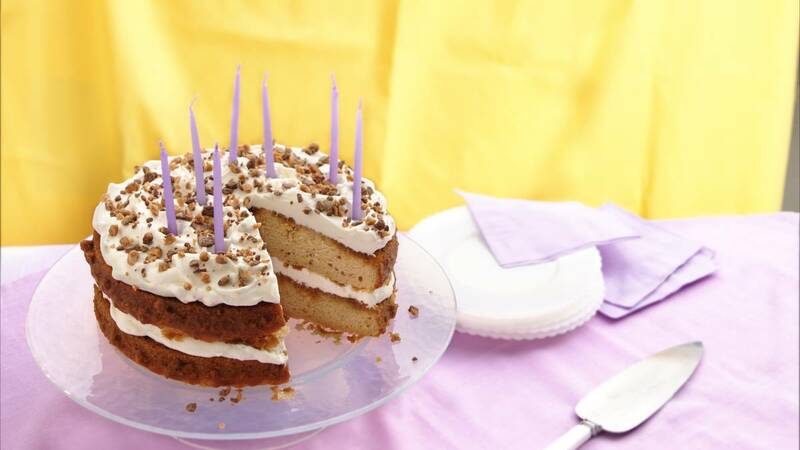 Use sparkler birthday candles for a festive effect.